Are You Ready to Fuel Up Whenever, Wherever with FBOMB Nut Butters? FBOMB Nut Butters are one of the best high-fat snacks you can find! We make them using a proprietary cool-grind process that produces a creamy base texture with a few small nut chunks. We believe this unique texture provides the ultimate nut butter experience! Nobody else has nut butters like ours and we hope you love them as much as we do. As an all-natural product, FBOMB nut butters will separate inside the pouch, so be sure to knead the packet before opening and consuming. Whether you’re a packet squeezer or a bottom-up pouch roller, you can enjoy a premium high-fat treat wherever life takes you! FBOMB Nut Butters are one of the best high-fat snacks you can find! We make them using a proprietary cool-grind process that produces a creamy base texture with a few small nut chunks. We believe this unique texture provides the ultimate nut butter experience! Nobody else has nut butters like ours and we hope you love them as much as we do. INSIDE THE FBOMB 4-PACK SAMPLER! Introducing our FBOMB Macadamia Pecan with Sea Salt Nut Butter, an all-natural blend of Dry Roasted Macadamia Nuts and Raw Pecans with a touch of sea salt crystals. Knead the packet to mix it up, tear off the top, and enjoy the smooth, creamy, and tasty power of fat-based energy wherever you are! 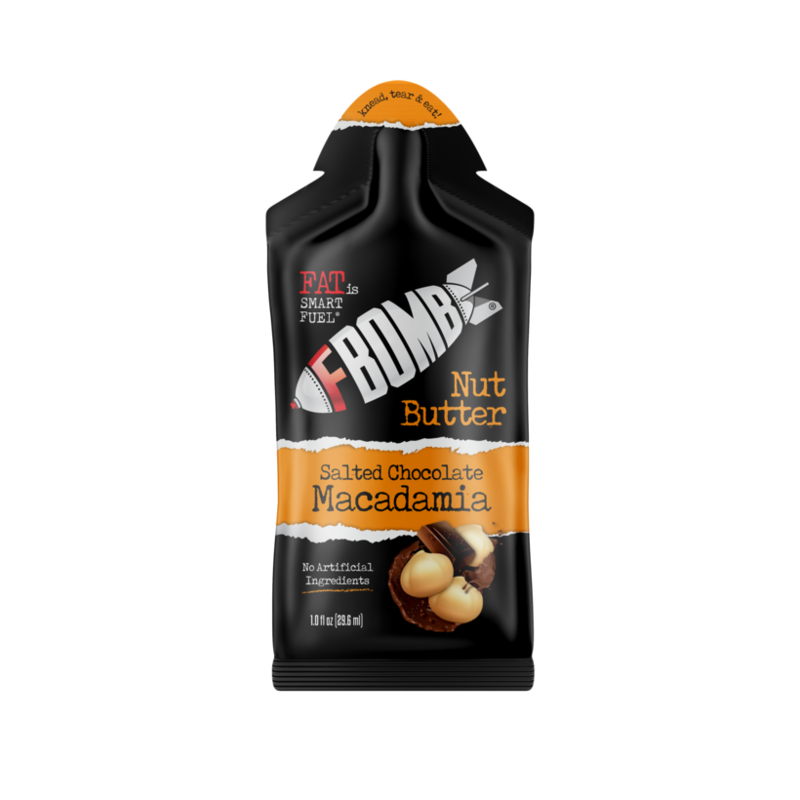 One of our most popular products, the FBOMB Salted Chocolate Macadamia Nut Butter is an all-natural blend of Macadamia Nut Butter, organic fair-trade dark chocolate, and a touch of sea salt crystals. Our FBOMB Macadamia Nut Butter with Sea Salt is all-natural Macadamia Nut Butter with an added touch of sea salt crystals. Macadamia nuts are known for their high-quality fat profile, with a very pleasant and mild taste. It’s the highest density energy source of its kind! Our first and original FBOMB Nut Butter is an all-natural blend of Macadamia Nut Butter and Coconut Butter with a touch of sea salt crystals. It’s the highest density energy source of its kind and is superior to most of the energy shots and bars out there. Macadamia nuts are a nutrient powerhouse! They are a rich source of vitamins and minerals, and are also packed full of monounsaturated fats and antioxidants. So you’re ready to start dropping some FBOMBs, huh? We’re here to share some delicious ways to introduce more fat into your diet. Once you know the basics, you’ll discover just how easy it is to eat more fat! Add an FBOMB to a cup of coffee, hot tea or beverage of choice. Stir and enjoy! Eat a FBOMB Nut Butter straight from the pouch as a high-fat snack! Enjoy it at work, at the gym, or while out on the trail. You can literally eat it anywhere. 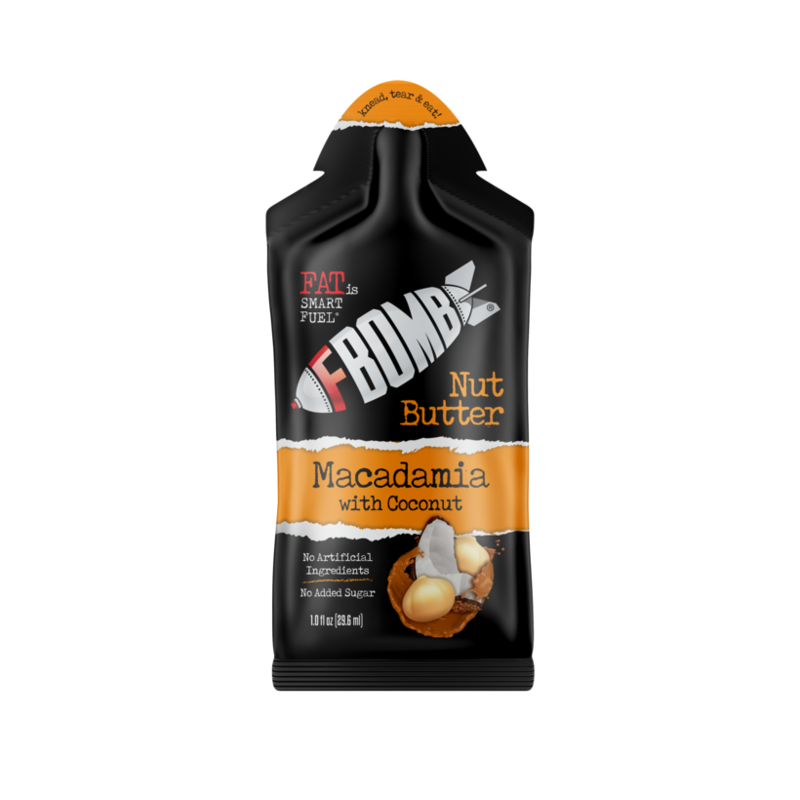 Squeeze a packet of FBOMB Macadamia Nut Butter into your smoothie.